I’ve got a Great Wheel !!!!! One blessing God gave me is a husband who loves doing woodwork. Over the past month, he set about to study plans and make me a Great Wheel. Now I have wanted one for some time but figured this was just going to be a dream for quite some time. But lo and behold Mark came in wanting some opinions on making it and away he went. It is made out of maple and at the stage below I loved just rubbing my hand over the wood. 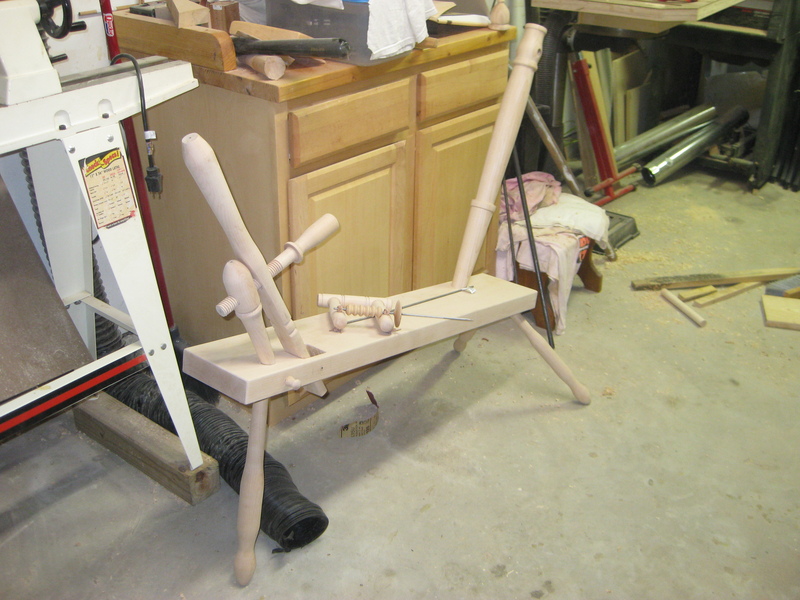 It was so satiny smooth on its own as he turned each piece and sanded it down. It was fun to watch him stress over making sure each piece would fit in just right as he made them. And would you believe that he only had one piece that he redid. 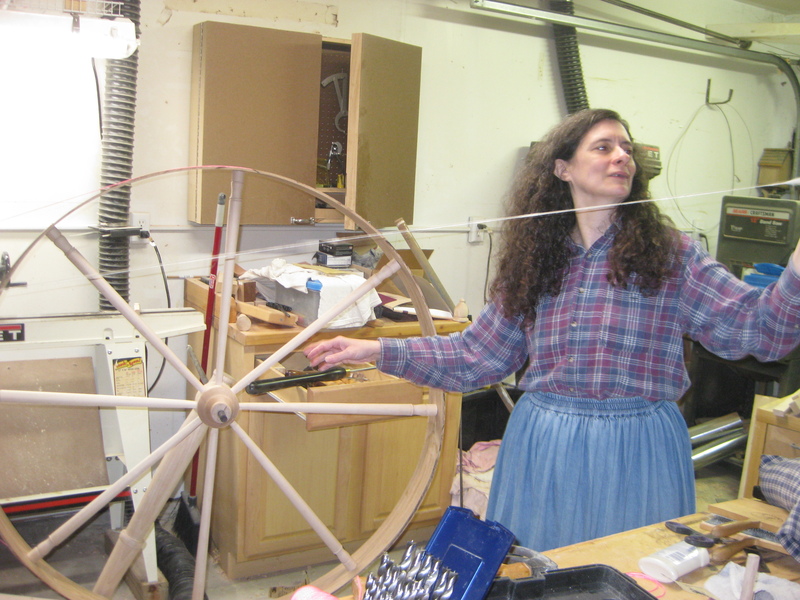 It slowly took shape and then came the night he wanted my help with getting the rim on the spokes of the wheel. That turned into an Abbott and Costello piece. If you had been a fly on the wall watching us, you would have been laughing more than we were. So break was declared and the next night he got a better set up and we tried again and it made it that time. The rim is white oak. Second try at forming the wheel rim. After a bit more work it was all together and ready for a trial run just to see if it all would actually work and it could be finished. Now Mark came to get me for this, and I am no more ready for a picture but here it is. He got me spinning my first little bit on my new wheel! Actually I’m sitting here in the same shirt and skirt. Great for being home but not for being seen. First time all together and trial run. It worked! So as it worked and worked well. 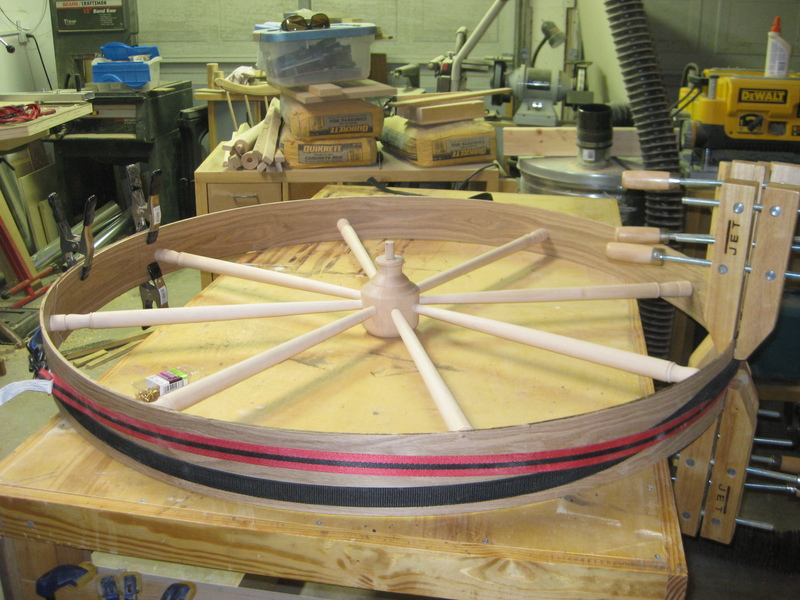 On he went with the finish work on the wheel. Mark had it ready the week before I had a period demonstrating event (Heritage Day at Jesse Jones Park). So with a bit of a week to practice and look like I knew what I was doing, I was off and spinning. And it was the star of my set up for Heritage Day. Mark sure got a lot of Oooos and Ahhhhs when people saw it. 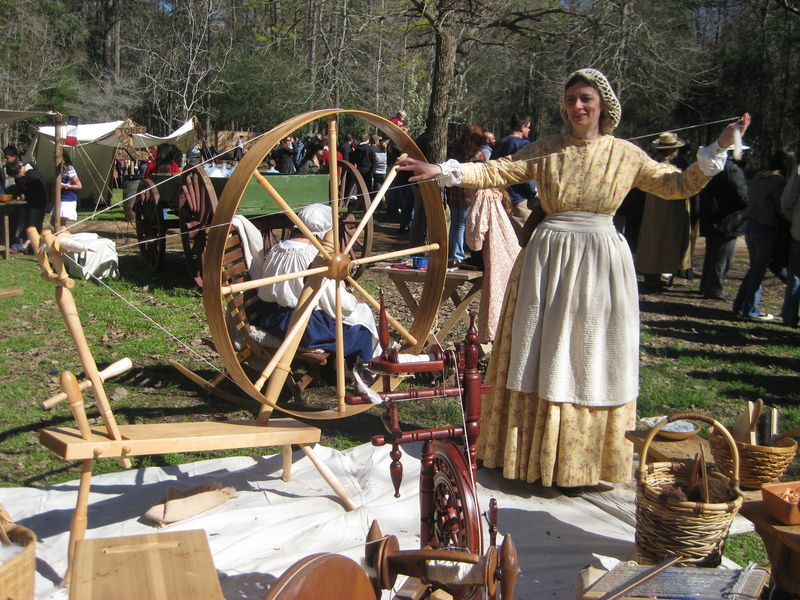 Demonstrating spinning on a Great Wheel at Heritage Day.